It is hard to accept that this is a museum. It is hard not to expect a member of the Gumpertz family, probably Mrs Gumpertz, to walk in and demand to know what I’m doing here, in their home. “Looking at your wallpaper,” is the answer. Mrs Gumpertz – Nathalie, née Rheinsberg – lived here, at 97 Orchard Street, on New York’s Lower East Side, a few doors south of Delancey Street. I’m standing in the apartment she occupied with her four children and her husband, Julius, until he left for work one morning in October 1874. He was a shoemaker, a heel cutter, and he never returned. I live in Dublin, a city of plaques. Renowned writers, revered nation-builders – the city seems to have been full of them. I often wonder what would happen to the architectural glory that is Georgian Dublin if someone unscrewed a plaque. It might collapse. There is a plaque on the front wall of a house across the street from my suburban home: Arthur Griffith, the founder of Sinn Féin, lived there. A ten-minute walk away, there’s another – Erwin Schrödinger, physicist and Nobel laureate, lived here between 1939 and 1956. Bram Stoker grew up ten minutes away in the opposite direction, although there’s no plaque on the side of that house. Presumably the current occupiers don’t want to see their front garden packed, railings to letterbox, with young Japanese vampires. There is a Stoker plaque on the side of a different house, on Kildare Street. I liked the plaques. I liked knowing that James Joyce lived here, and here, and here and here and here, and that Lord Edward Carson was born over there. I like the surprises – Sheridan Le Fanu lived here, Ernest Shackleton lived here, Ludwig Wittgenstein liked to sit and write at these steps in the winter months of 1948 and 1949. The plaques seem to add depth to the city, to make it at once more Irish and less insular. It is right to celebrate and point out the hard work, the ingenuity, the good luck and bad luck that made these names so famous. But there is the limitation: fame. I have never seen a plaque saying “Mary Collins lived here, 1897-1932; she loved her family”, or “Derek Murphy, 1923-2001, printer, sat on these steps and had a smoke on his way home from work. He liked a laugh and always tried his best. 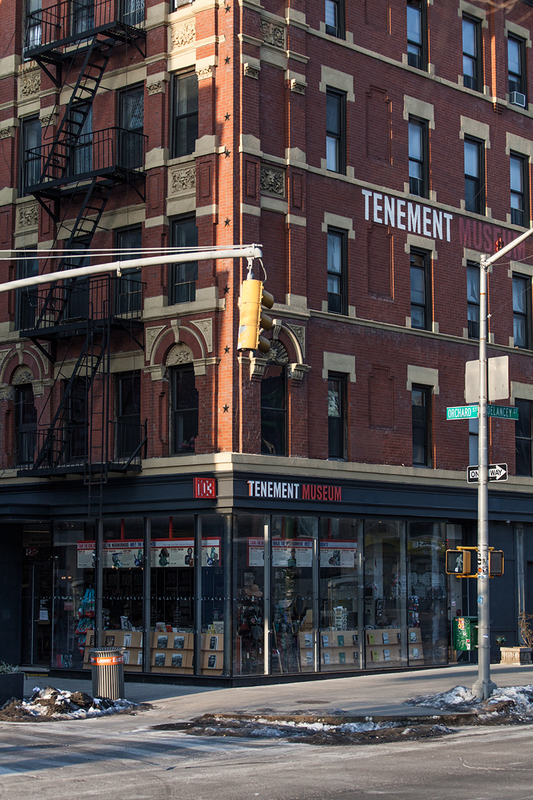 That is why the Tenement Museum is so special and why I’m here for the third time in 15 years. No famous people lived here. But people did. I’m standing in front of a sewing-machine very like the one that Nathalie Gumpertz must have used to keep her family alive after her husband walked out. We will never know why he left, and that is a big part of the museum’s appeal. Each room is assembled – or reassembled – from facts. Birth certificates, census details, court testimonies, pieces of cloth, fragments of wallpaper, corners of linoleum. The rest is left to us. We know he left and we know he never returned. We stand in this room which has been left – seems to have been left – as it was soon after Nathalie and her children realised that he wasn’t coming home. We look at the sewing-machine. It is tiny compared with a modern model. There was no electric light, no gaslight. Four or five strides would get us from one end of the apartment to the door and the narrow, dark hallway outside. Water had to be collected in buckets from the back of the house, down – and back up – three flights of stairs. Nathalie might have applied for Outdoor Relief, $2 a week, usually in goods – bread, coal – not cash. She might have petitioned her landlord, Lucas Glockner, for help with the rent. She might have been given her sewing-machine by the newly formed United Hebrew Charities. We don’t know. The word “tenement” means a building that houses three families or more. Standing in this room gives the word its emotional clout. But the wallpaper is beautiful. It is a sunny, cold, clear morning but the wallpaper would be beautiful in any weather. It is floral, and gorgeous. I’m not someone who notices wallpaper or furniture. I think that is the first time I have written the word “floral”. But this wallpaper is important. It lifts the Gumpertz family – my Gumpertz family – out of misery and sentimentality. It is not the original paper. There are five storeys to this house, and five apartments per floor. 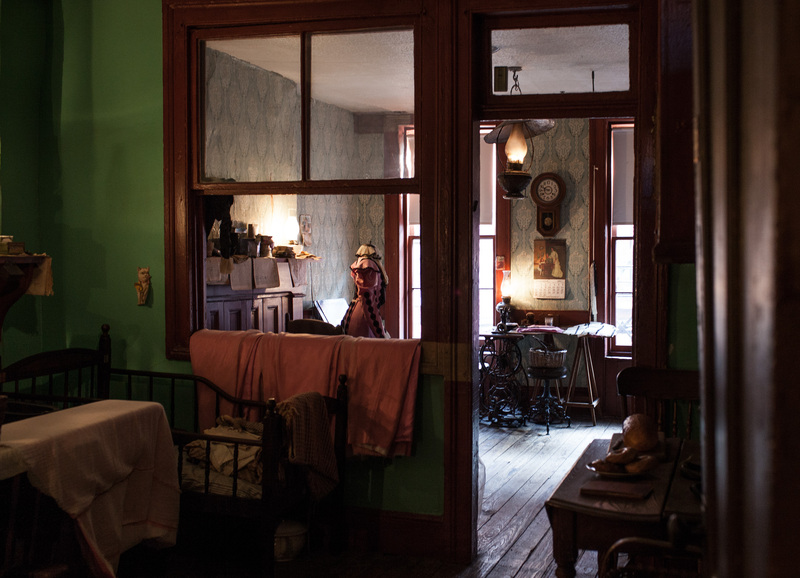 In some of the rooms, the people who changed this tenement into a museum found up to 20 layers of wallpaper. They took a fragment of the Gumpertz paper to the company that might have manufactured it in the 1870s, and the company made enough new rolls to cover the parlour walls. 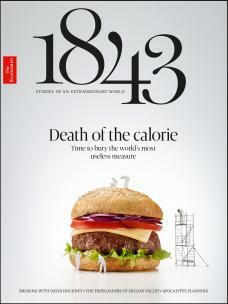 But – here is where it’s brilliant – the new paper looks as if it’s been on the walls for 140 years. The paper looks like an act of defiance: life is dark but the walls are bright and intricate. Nathalie’s husband had disappeared and one of their four children, Isaac, died eight months later. The 1870 census lists Nathalie as “keeping house”; by 1880 she’s a “dressmaker”. The parlour, the front room, has become Nathalie’s “shop”, where her clients come to place orders for alterations to dresses and jackets. They walk into a bright, cheerful room, into success, hope, faith in the future, faith in the power of a well-stitched garment. There is one photograph of Nathalie in the room, taken around – or “circa” – 1880. 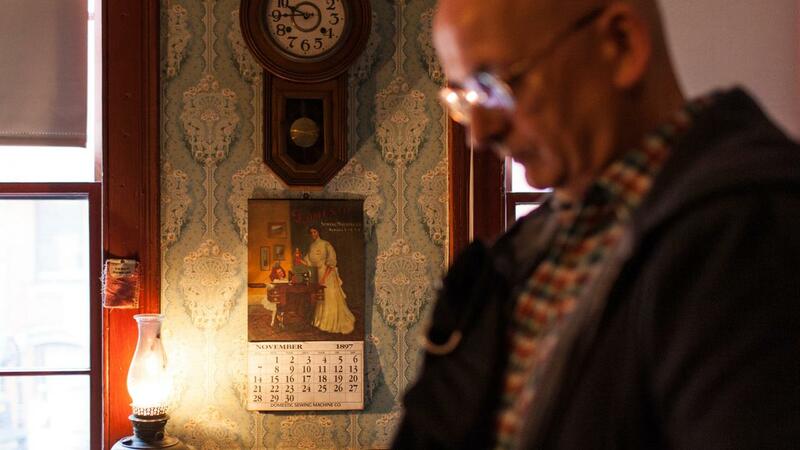 (“Circa” gets used a lot in the Tenement Museum literature.) She looks tough and careful. She looks like a woman who can make people laugh when she wants to, or needs to. The tenement at 97 Orchard Street was built in 1863 by Nathalie’s landlord, Glockner, a German immigrant, a tailor. At the time, the area now known as the Lower East Side was known as Kleindeutschland – Little Germany. Between that year and 1935, when it was condemned as a residence, at least 7,000 people, immigrants or the children of immigrants, lived there. They came from more than 20 countries. To the visitor, this visitor, Orchard Street is Robert De Niro in “The Godfather: Part II”, using the rooftops on his way to killing Don Fanucci. Keep our eyes above ground level, and we could be looking back 100 years, and more. Standing on the stoop outside the Tenement Museum – even the word “stoop” is exciting; in Ireland we only have steps – I’m looking at a film, hundreds of films, dozens of my favourite scenes. Layers of life: the apartments have been left exactly as they were found; they "belong to the dead"
Inside, in the dark of the narrow hall, I’m brought further back, out of the age of film. (Mind you, it is very like the hall De Niro stood in, his gun wrapped in a blanket, waiting to shoot Don Fanucci.) It is like looking at a Jacob A. Riis photograph; I’m almost stepping into it. Riis’s photographs of the New York tenements and the appalling living standards of the people who lived in them, and his book, “How the Other Half Lives” (1890), had forced major housing reforms and improvements. Riis might have stood in this hall. He might have passed through on his way up to photograph and speak to the tenants. It is a bright day outside but the hall is gloomy. (Gas jets were installed in 1905, and electric light in 1924.) It must have been frightening, and dangerous. The wall covering, hung in 1905, perhaps as a response to the installation of the new gaslight, is made of burlap, treated with linseed oil. It is an arresting surface, and attractive, but I can’t help seeing a big urchin playing with a box of matches while my babies sleep upstairs. It is the flaking paint that is strangely moving. This isn’t a re-creation. This is the hall as it was; this is the paint. I’m standing where Nathalie Gumpertz passed on her way to fetch water, where, later, Josephine Baldizzi, one of the last tenants, stepped on her way out to school. Their shoulders rubbed these walls; Baldizzi family shoulders brushed against this paint. Prams were parked, buckets of coal and bolts of cloth were carried through. People just off Ellis Island huddled here and wondered what to do. The life of the house is in the walls, behind the flaking paint, in the flaking paint. It’s tempting to rub a hand across a slice of wall, to eliminate the neglect and age, to watch the flakes lift and fall – to cough and laugh. But this hall belongs to the dead and it is actually beautiful, as Havana is beautiful. The question, “Why don’t they mend it?” is quickly forgotten. The ceiling is pressed metal; the plaster arch, the wooden wainscotting date back to 1863. It is grand and it is also squalid. It is a bit like America must have seemed to the new arrivals. I know I’m standing in a slum now but there is a painting – a roundel, a medallion – in front of me. There is another one behind me but it is a black smudge. This one has been restored. It is a wooden house, blue sky, bright grass, like the work of a talented child. It is hard to figure out why it is on that particular wall. But it is there and it is bright and, somehow, hopeful. The improvements that Glockner made over the years were demanded by legislation but he must have been proud of this house. It was new once. Upstairs are rooms that have been left as they were found in 1988. Layers of wallpaper and paint; layers of linoleum. Layers of life. I have often walked through old, neglected houses and imagined making them mine, doing them up and living in them. But there is something precise about the neglect here, even something magical. It is not neglect at all; it is respect. People lived here – people live here. It is the same further up, in the re-created households, the Gumpertzs’ home, and the Rogarshevskys’, the Levines’, the Moores’, the Baldizzis’. The details – a doll, a baby’s undershirt, a pair of scissors, a tin of Colman’s mustard powder – clutch at us and bring us right up to these people. Strangely, the repeated words, “circa” and “might”, do the same. They calm us down and allow us to move about and feel ourselves at home. The past seems to disappear – the Colman’s mustard looks exactly as it does in my local supermarket. There is very little space but it is used ingeniously. The interior windows – big windows in the inside walls – seem odd, even a bit unsettling. But they work. Daylight gets into the deepest corners. These lives were hard but they were lived in the place where home and cleverness met. 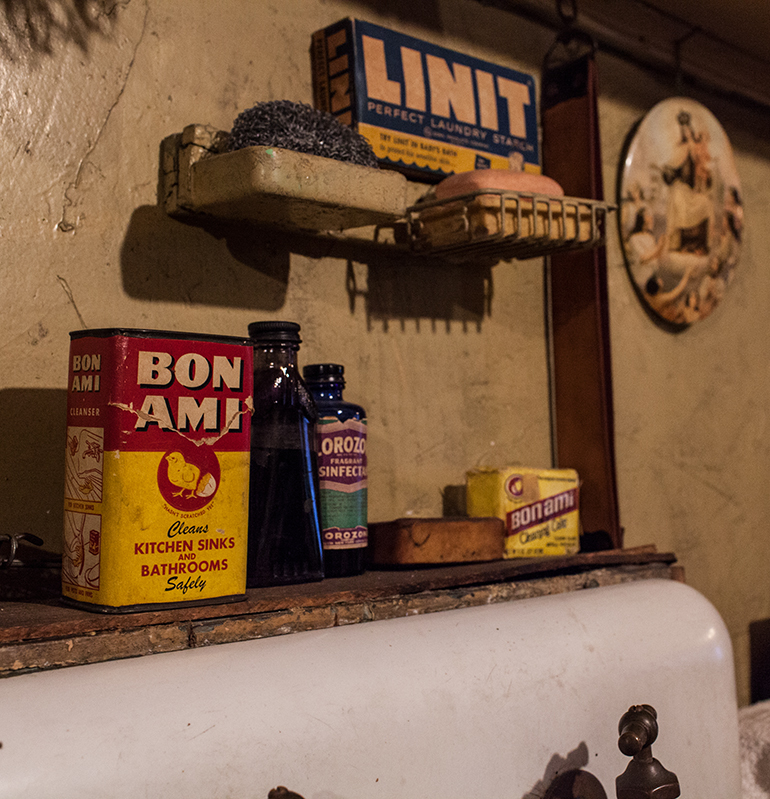 The Baldizzi apartment has something extra, the voice of Josephine, born here in 1926. She left when she was nine, in 1935, when her family was evicted. Her recorded voice fills the rooms. It is a big voice, and very American. Her life here wasn’t miserable. “My father could make anything. He had hands of gold.” So did the people who decided that this house was to be a museum. In 1883, nine years after Julius Gumpertz walked out of 97 Orchard Street, Nathalie received notice that her husband had inherited $600, following the death of his father, in Prausnitz, Germany. Julius had to be declared legally dead. Lucas Glockner, her daughter, Rosa, and Nathalie herself signed written testimonies, verifying Julius’s disappearance, and Nathalie became the official administrator of his estate. Six hundred dollars was the equivalent of more than four years’ rent. She moved, with her three daughters, uptown – further into America – to Yorkville, on the Upper East Side. She could afford to, and the Lower East Side was changing. Many of her new neighbours, like Nathalie, were Jewish. But they were eastern European; they spoke Yiddish. Yorkville was where the Germans were moving to. In 1886, she was living in 237 East 73th Street, and her occupation was “widow”. She died eight years later, aged 58, and left her daughters $1,000. They all married within a year of their mother’s death. In 2009, Julius was finally tracked down. He had died in a Jewish Home for the Aged and Infirm in Cincinnati, Ohio, in 1924. His occupation was “huckster”. 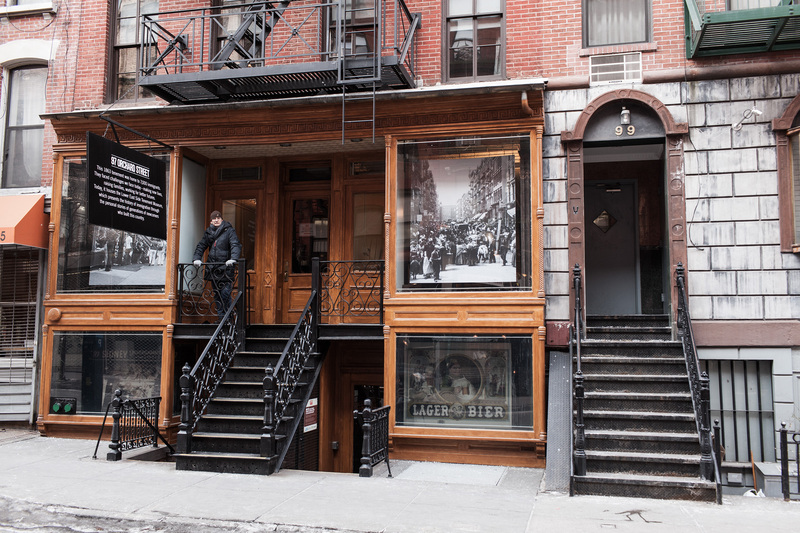 The Tenement Museum 103 Orchard St, New York, open daily.